Dissent, feedback, innovation and adaptation are the only sustainable sources of stability, prosperity and well-being. I would very much like to learn your thoughts on what careers may be viable for our children. With the future likely to change our lives so dramatically, where do you see opportunities for some form of career growth and some form of stability? Thank you for the question, Michael. 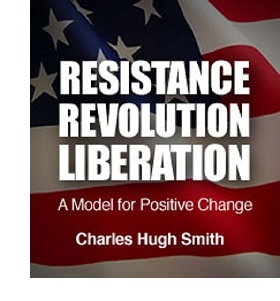 All of my books can be read as attempts to answer this question: or Weblogs & New Media: Marketing in Crisis, Survival+: Structuring Prosperity for Yourself and the Nation, An Unconventional Guide to Investing in Troubled Times and Resistance, Revolution, Liberation: A Model for Positive Change. 1. The next 20 years will not be like the last 20 years, so projecting current mainstream trends will very likely lead to wrong answers. Trends change, cycles turn, and so predicting the future by extrapolating current trends leads to faulty conclusions about the future. 2. Centralization of the State and economy was the dominant trend for the past two centuries: that model has failed and will be replaced by decentralization. The expansive Central State (a.k.a. the Savior State) now dominates the economy and society; everything not within its direct control is considered a threat. The State enforces a self-serving financial feudalism based on financializing the economy to benefit the few and indenture everyone else into debt-serfs. We are like the Ming Dynasty in 1340: the State and empire seem permanent and enduring, yet four years later the entire system collapses under its own weight as all the internal rot that was masked by propaganda and political expediency finally gives way. 3. The Internet cannot be put back in the genie's bottle, nor can it be limited to serve the State and Elites like the police forces, financial system, etc. The Web has a simple ontological imperative: creatively destroy monopolies and every effort to limit information, dissent and feedback. To the degree the Central State is a monopoly that limits information, dissent and feedback to protect itself, it too will be dismantled by the Web. 4. The Central State and financialization are the buggy whips of the coming era.Those depending on making buggy whips in 1901 decried the rise of automobiles, but their resistance to the tides of change did not stop or even hinder those tides. For the past 60 years, financial security flowed from the Central State and the various monopolies it enforced or controlled. For the past 30 years, wealth flowed from the relentless financialization of the U.S. and global economies. Those cycles are ending, and whatever financial security is possible going forward will flow from self-reliance, self-organizing social capital, and decentralized social and technological innovation. It boils down to a simple choice: either ride the tide of creative destruction of failed/ depleted models or be washed away by the tide. 5. The non-market economy has been eroded by the State and financialization.The market economy (consumerism, financialization, the State) has turned our society into a high-cost-basis economy that generates an abundance of poverty and social defeat. The alternative is a low-cost-basis society where social capital counts for more than consumerist identifiers and debt-based "prosperity." What does this mean in a practical sense? 1. Let go of old models of financial security. Do not assume a government job means 30 years of security and a fat pension thereafter. That's the past, not the future. 2. Assume monopolies and cartels imposed by the State will be disrupted and implode. The key example here is the sickcare system imposed by the State. For decades people have seen sickcare expand year after year, and so it seems sensible to assume that joining healthcare a.k.a. sickcare was a path to security. Sickcare now absorbs 17% of the U.S. economy, roughly double that of other industrialized democracies. Thus we can assume this percentage will revert to the mean, i.e. shrink by 50%. "Healthcare" as currently practiced is another buggy whip industry doomed to be creatively disrupted and remade. 3. The best career strategy going forward is to assemble multiple skillsets. What we know is that current models will be disrupted, but we cannot know the future. Thus we cannot know which skillsets will be demand. That may change constantly; "security" will flow not from clinging to failing institutions for 30 years but by being flexible and adaptive. What sort of skillsets will likely be in demand? 1. Essential practical skills. These include cleaning teeth, repairing aging vehicles, maintaining natural gas distribution pipes, configuring web servers, growing and preparing food, organizing community events, overseeing projects to completion, and so on. There are many such skillsets. The key is to learn skills that don't depend on an institution or a State-imposed monopoly for their existence. For example, if you learn how to teach effectively and are open to dissent, feedback, innovation and adaptation, then you can teach just as well in an informal "charter school" environment as in a formalized, centralized institution (of the sort that's being creatively disrupted and replaced by lower cost, decentralized, self-organizing networks). 2. Internet skills. This doesn't mean knowing how to add songs to an iPod or smartphone, it means learning some technical aspect of the web well enough that you can do something useful for others with that skill. Examples include configuring a server, managing security of a network, implementing content-management software (Drupal, etc.) or knowing a coding language that is in demand (this will change over time, of course). 3. Accounting. Keeping track of money, assets and projects will remain key skills. Knowing how to do so is a practical skill, even if it is knowing Quicken or an equivalent electronic checkbook. Understanding how to organize and track progress in a complex project is a practical skill. 4. Written communication. Being able to write effectively is a key practical skill. Whatever the setting or project, some things will need to be stated in writing. 5. The ability to work with others. This includes learning to be patient, empathetic and positive, and gaining the ability to get something done despite the constant pettiness and contrariness of human beings. This also includes recognizing that there must be a "membership" that grants privileges and responsibilities to members and excludes non-members, a membership which can eject destructive members into the outside world. We can't be everything to everyone. 6. Understand that dissent, feedback, innovation and adaptation are the only sustainable sources of stability, prosperity and well-being. If a young person has mastered an essential practical skill, a web-based skill, a working knowledge of accounting/data management, project organization and basic writing, they will be in demand by some group, organization, enterprise or community. Thank you, Robert K. ($15), for your much-appreciated generous contribution to this site--I am greatly honored by your support and readership. Thank you, William N. ($5), for your most generous contribution to this site--I am greatly honored by your support and readership.